The above info came from Joe M, and was edited by yours truly (contact me). The image came from Neon Genesis Evangelion.be. Bardiel is actually a parasitic Angel that can control almost anything with mechanical properties. 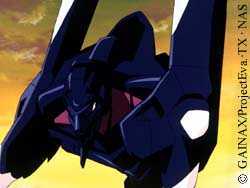 Bardiel gains all capabilities of its hosts that it invades, which is a nightmare come true for NERV. Bardiel invades the new Unit 03 and traps its pilot, Toji Suzuhara, in the entry plug. Shinji, unable to attack the Angel, is disconnected from the Evangelion and the dummy plug takes over. Unit 01 destroys Bardiel but Toji lives through the incident. The above description came from Joe M, and was edited by yours truly (contact me).